I found a good deal on diapers the other day that I thought I'd share. Now through February 28th you can get $25 off a purchase of $100 or more on any Pampers products (Pampers, Luvs or Kandoo soap). 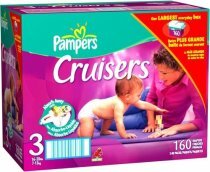 Just enter in the code PAMPERS2 when you're checking out (on the right hand side of the final "Place your order" page. It's not like you weren't going to buy them anyway. And hey, $25 is $25. Click this link to check out the deal or Shop for Pampers at the Modern Day Dad Store (just don't forget to enter the code.